The conquest of the German Kameruns, a vast inland empire with a population of 3,500,000, occupied the Allies the greater part of five months. Here the Germans had organized a large force of native levies, mostly Bantus and Sudanese, who were drilled and led by German officers and provided with machine guns. Excepting in the highlands, the Kameruns is not habitable for whites. Its climate is deadly and it contains vast stretches of desert land visited by sand storms. Early in August, 1914, the Allies invaded the Kameruns from three directions—two French columns crossing the border from the Congo, while an English force crossed over from Nigeria. On August 31, 1914, a brigade of Dublin Fusiliers, with some native troops, led by Lieut. 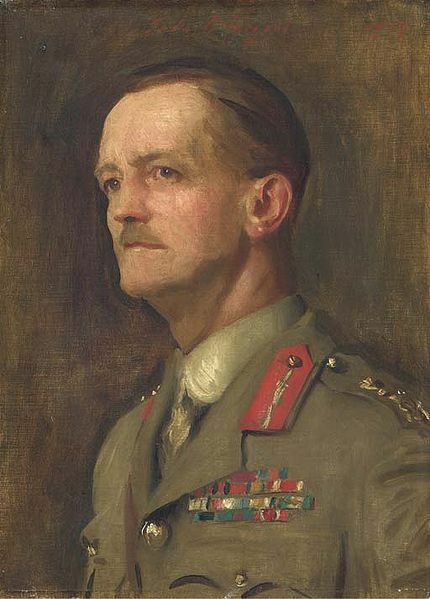 Col. MacLear, while attempting to storm the German position at Garna, were almost annihilated by machine-gun fire, the remnant of the British forces retreating into Nigeria. A second British expedition, composed largely of native Nigerians, occupied the German station of Nsanakong in August. Here they were surprised by a large German force and defeated with heavy losses. The surviving Nigerians cut their way out with the bayonet and escaped back to Nigeria. About the same time, a third British-Nigerian force occupied and held Archibong. In retaliation, the Germans sent a force across the Nigerian frontier, which seized and occupied the station at Okuri. Naval operations were begun on the west coast in September, when the Germans sowed the channel of the Kamerun estuary with mines and further attempted to obstruct the waterway to Duala, the capital, by sinking several old steamships in the channel. British gunboats, however, soon cleared the passage and a fleet of British troopships steamed up the estuary on Septembr 26, 1914. Duala was bombarded and its capitulation followed the next day. Bonaberri, across the river from Duala, surrendered a few days later. Meantime, a French squadron had bombarded Ukoka and sunk two German vessels in the bay. A British naval and military force, sailing up the Wuri River in launches on October 8, 1914 attacked the Germans near Jabossi, but were driven back to Duala. On the same day a French brigade attacked a German force at Japons, compelling their retreat to the mountains. Strongly reinforced, the Allies, on October 14, 1914, again attacked Jabossi, silencing the batteries and occupying the city. Meanwhile, a regiment of Nigerian troops had routed the German-native forces at Susa and in the Lake Chad region. The main body of the German-native forces was pursued in two columns by Anglo-French troops, commanded by Gen. Dobell and Col. Mayer. The Germans were quickly expelled from Edea on October 26, and from Mujuka a few weeks later. Buea, after a spirited bombardment, was captured and the Germans were driven back to the hills. Another French expedition, led by Gen. Aymerich, drove the enemy out of the Congo-Ubanghi region, capturing Numen and Nola. By December 20, 1914, the entire northern railroad line was in possession of the Allies and the German-native troops everywhere had been driven far into the interior. The Kameruns, though not wholly conquered, were pratically in control of the British and French. German Cameroons (German: Kamerun) was a West African colony of the German Empire from 1884 to 1916 in the region of today's Republic of Cameroon. The first German trading post in the Duala area (modern Douala) of the Kamerun river delta was established in 1868 by the Hamburg trading company C. Woermann. The firm’s agent in Gabon, Johannes Thormählen, expanded activities to the Kamerun delta. In 1874, together with the Woermann agent in Liberia, Wilhelm Jantzen, the two merchants founded their own company, Jantzen & Thormählen. Both of these West Africa houses expanded into shipping with their own sailing ships and steamers and inaugurated scheduled passenger and freight service between Hamburg and Duala. These companies and others purchased extensive acreage from local chiefs and began systematic plantation operations. By 1884, Adolph Woermann, representing all West African companies as their spokesman, petitioned the imperial foreign office for "protection" by the German Empire. Chancellor Otto von Bismarck sought to utilize the traders on site in governing the region via "chartered companies," however, in response to Bismarck’s proposal the companies withdrew their petition. At the core of the commercial interests was pursuit of profitable trading activities under the protection of the Reich, but these entities were determined to stay away from political engagements. Eventually Bismarck yielded to the Woermann position and instructed the admiralty to dispatch a gunboat. As a show of German interest, the small gunboat SMS Möwe arrived in West Africa. The protectorate of Kamerun was established during the period generally known as Europe’s imperialist "Scramble for Africa". The German explorer, medical doctor, imperial consul and commissioner for West Africa Gustav Nachtigal was the driving force toward the colony’s establishment. By then well over one dozen German companies, based in Hamburg and Bremen, conducted their trading and plantation activities in Kamerun. With imperial treasury subsidies, the colony built two rail lines from the port city of Duala to bring agricultural products to market: the Northern line of 160 km to the Manegua mountains, and the 300 km long mainline to Makak on the river Nyong. 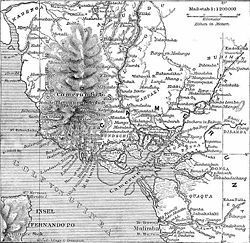 An extensive postal and telegraph system and a river navigation network with government ships connected the coast to the interior. The protectorate was enlarged with Neukamerun in 1911 as part of the settlement of the Agadir Crisis, resolved by the Treaty of Fez. The colony was invaded in 1916 by the British and French during World War I. Following Germany's defeat, the Treaty of Versailles divided the territory into two League of Nations mandates (Class B) under the administration of Great Britain and France. French Cameroun and part of British Cameroons reunified in 1961 as Cameroon.